The dreaded smallpox virus was eradicated more than 40 years ago, but the threat of its return still looms. In an effort to develop a safer vaccine substitute, Canadian researchers have resurrected a close relative—the extinct horsepox virus—from scratch. 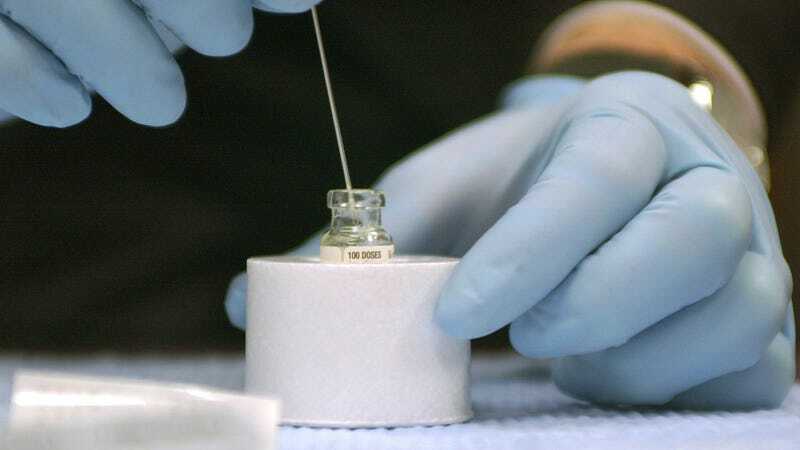 Critics say the exercise was pointless, and because the results were published in an open access journal, they fear the smallpox virus can now be manufactured by virtually anybody—terrorists included. Researchers from the University of Alberta revived the horsepox virus by referencing a publically available genome sequence and by chemically manufacturing DNA fragments from scratch. They say it’s the first complete synthesis of a poxvirus (a family of nearly 70 known viruses that includes smallpox, cowpox, and horsepox), and that it’s the largest virus ever assembled using chemically synthesized DNA. News of this work first emerged in July 2017, but the publication of the results in the open access journal PLoS One on January 19, 2018 has sparked fresh waves of concern. Some critics say the research was unnecessary, as safe and effective vaccines for smallpox already exist. And because the recipe for horsepox was made available online, there’s genuine concern that the technique could get into the wrongs hands; if you can synthesize horsepox virus, you can pretty much synthesize any virus in the poxvirus family—including variola, the virus responsible for smallpox. Smallpox is now contained, but it was responsible for outbreaks in the 18th century that killed around 400,000 Europeans annually, and approximately 300 million to 500 million people worldwide in the 20th century. The Canadian researchers, virologists David Evans and Ryan Noyce, say their work is justified, and that they did it to develop a better smallpox vaccine, and to further the science of synthetic biology. But to understand why they had to re-create an extinct virus (horsepox virus) to fight another virus (smallpox virus), we need to go back in time. During the 18th century, English biologist Edward Jenner came to the realization that the cowpox virus is strangely effective at making humans immune to smallpox. As its name implies, cowpox affects cattle, but it’s harmless to humans. Jenner, after noticing that milkmaids rarely contracted smallpox, figured that the cowpox virus, which could be contracted through lesions and blisters on a cow’s udder, had something to do with it. This monumental discovery is what eventually enabled scientists to completely eliminate the disease less than 200 years later. No cases of naturally occurring smallpox have been reported since 1977, and the last few samples of the virus are currently being held by the United States and Russia for safe keeping. The virus responsible for smallpox immunity is called vaccinia. Weirdly, scientists aren’t entirely sure where the vaccinia virus originated, though it’s virtually identical to the cowpox virus (the word “vaccine” comes from the latin “vacca” which means cow). In the past, vaccinia and cowpox were considered to be the same, but they may have branched off from a common ancestor. But there’s another theory—one that’s being entertained by the University of Alberta scientists and their funding partner, the NYC-based Tonix Pharmaceuticals Holding Corporation: Vaccinia may have originated from horses. This is not a completely outrageous assertion, given that vaccinia is about 99.7 percent identical to the horsepox virus. Horsepox went extinct on its own, and, like cowpox, it’s harmless to humans. Evans and Noyce wanted to explore this virus for possible protective effects, but acquiring samples wasn’t possible; the CDC, which safeguards a sample of horsepox, didn’t hand it over. So the researchers decided to make their own version. “Tonix’s goal is to develop a vaccine that has a better safety profile than the current vaccines for broader usage and to provide greater protection to the public,” said Seth Lederman, president and CEO of Tonix, in a statement. In the past, about 1,000 people for every 1 million people vaccinated for the first time experienced reactions that, while not life-threatening, were serious. These reactions include a vigorous (toxic or allergic) reaction at the site of the vaccination and spread of the vaccinia virus (the live virus in the smallpox vaccine) to other parts of the body and to other people. These reactions typically do not require medical attention. Rarely, people have had very bad reactions to the vaccine. In the past, between 14 and 52 people per 1 million vaccinated experienced potentially life-threatening reactions, including eczema vaccinatum, progressive vaccinia (or vaccinia necrosum), or postvaccinal encephalitis. Based on past experience, it is estimated that between 1 and 2 people out of every 1 million people vaccinated may die as a result of life-threatening reactions to the vaccine. Smallpox may be gone, but it’s still a major concern. Today, the vaccine is mostly used to protect first responders and military personnel; the general public hasn’t been inoculated against smallpox for decades. There’s a chance that smallpox could re-emerge naturally, or be manufactured as a bioweapon. Tonix is working on a synthetic version of horsepox to create a potentially safer vaccine substitute. In tests, the resurrected lab-grown virus was shown to protect mice from lethal doses of vaccinia. Looking ahead, Tonix would like to test the synthetic stuff on humans in carefully controlled trials. In terms of publishing this work for all to see, and the risk of it getting into the wrong hands, the researchers say it’ll allow scientists to stay one step ahead of the enemy. This issue is reminiscent of “gain of function” studies in which viruses are genetically tweaked to afflict humans. For example, researchers have modified the H5N1 bird flu such that it’s transmissible to humans. Gain of function studies are designed as a kind of pre-emptive strike against viruses before they naturally mutate into something dangerous, or before unscrupulous humans do the same. But many scientists say it isn’t worth the risk. As Kai Kupferschmidt points out in Science Magazine, some scientists are less than thrilled with this line of research. He quotes Stephan Becker from the University of Marburg in Germany, who says safe vaccines exist and that there’s no market for a horsepox-based replacement. And as Andreas Nitsche of the Robert Koch Institute in Berlin told Kupferschmidt, “If anyone wants to recreate another poxvirus, they now have the instructions to do that in one place.” Weirdly, the University of Alberta scientists didn’t discuss any safe alternatives, such as a weakened vaccinia strain called Modified Vaccinia Ankara (MVA) or a similar vaccine developed in Japan called LC16m8. Thanks for your interest in the work. Many of these are questions that Dr. Noyce and I are addressing in a forthcoming article. I can let you know when it’s published. Sounds like they’re constructing a carefully thought out response, one they expect to publish in about two weeks. But why did they wait so long, and are they writing the article in consideration of the backlash? Regardless of whether this work is safe or necessary, this should have been part of a larger conversation, given the seriousness of smallpox’s threat to humans.